T-Mobile has confirmed that the Galaxy S 4G will be available this month. The Galaxy S 4G is an updated version of the Samsung Vibrant, one of my favorite smartphones. The Galaxy S 4G provides many of the updates to the Vibrant I expected—4G, front-facing camera, Android 2.2 and personal Wi-Fi hotspot. The Galaxy S 4G also uses updated HSDPA+ "4G" technology that allows theoretical peak download speeds of up to 21 Mbps (versus 14.4 Mbps for current 4G models on T-Mobile). In real life, you can expect actual speeds to be slower, but still pretty darn fast. Beyond those updates, the new Galaxy S 4G is very similar to the Samsung Vibrant and other Galaxy S phones, with the same 4-inch Super AMOLED display, 5MP camera and 1GHz Cortex A8 Hummingbird Processor. A 16GB microSD card will come pre-installed. The other big change from the Vibrant? The Galaxy S will come shipped with the movie Inception instead of Avatar. While the Galaxy S 4G doesn't have the mega processing power of the upcoming Motorola Atrix or Droid Bionic, it should be a great choice for phone buyers looking for a lot of features in a slim, light package. 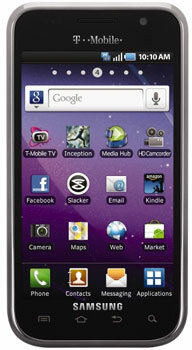 And compared with the MyTouch 4G, the Galaxy S will have faster 4G and should come in slightly lighter. Exact release date and pricing have not yet been announced (though my money is on $199.99).